So… DEARBORN & ELM officially exists! We made our Etsy debut earlier this week, posting a handful of our hair tie packs for the world to see. Please, take a look and tell us what you think! Every August, the Perseid meteor shower puts on a dazzling display. In fact, the celestial event will hit its peak this week, so it’s not too late to wrap yourself up in a cozy blanket and catch a glimpse of shooting stars as they race across the Summer sky. Like so many of us, I’ve always had a deep fascination with space. Nebulas, galaxies, constellations – the universe is a stunningly beautiful and truly curious place. While taking stock of my craft supplies this week, I realized that stars have not only worked their way in to my collection of beads and ribbons, but they have begun to influence my overall design aesthetic. I found these delightful Cära pavé star earrings at Target and I wear them constantly. Since I much prefer studs over dangling earrings or hoops, I’m thrilled when I discover a quirky post earring. The sheer ribbon with the gold stars was an impulse buy. I’ll admit that I have no idea what I’m going to make out of it, so in the meantime I’ll just enjoy the ribbon’s delicate beauty. If you have a suggestion for a craft idea send it my way! The beaded bracelets are a product of recent late-night downtime. DJ has just returned from his six-week Berlin adventure (see Sarahrulu’s blog post for more details ), and we’ve been enjoying quiet evenings at home. 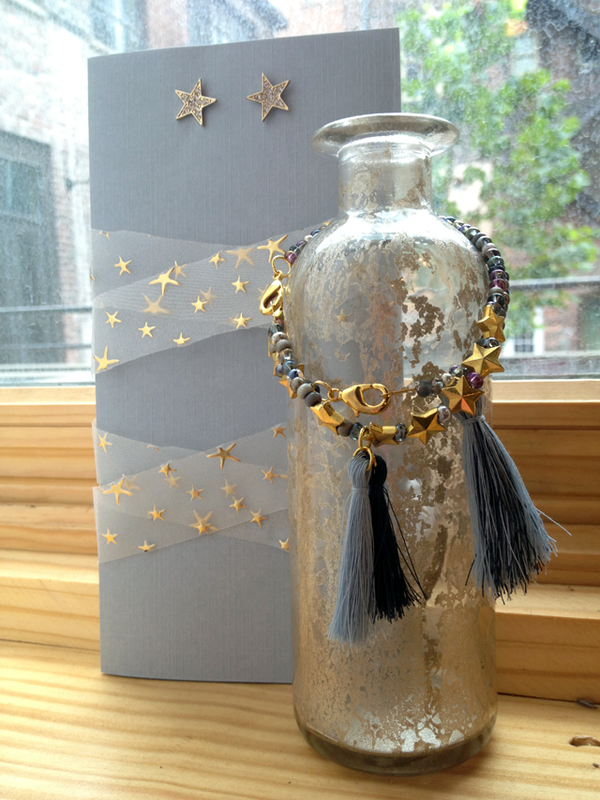 In about an hour, I created two bracelets adorned with handmade tassels, gold stars, and shimmery seed beads. The thread tassels remind me of comets! 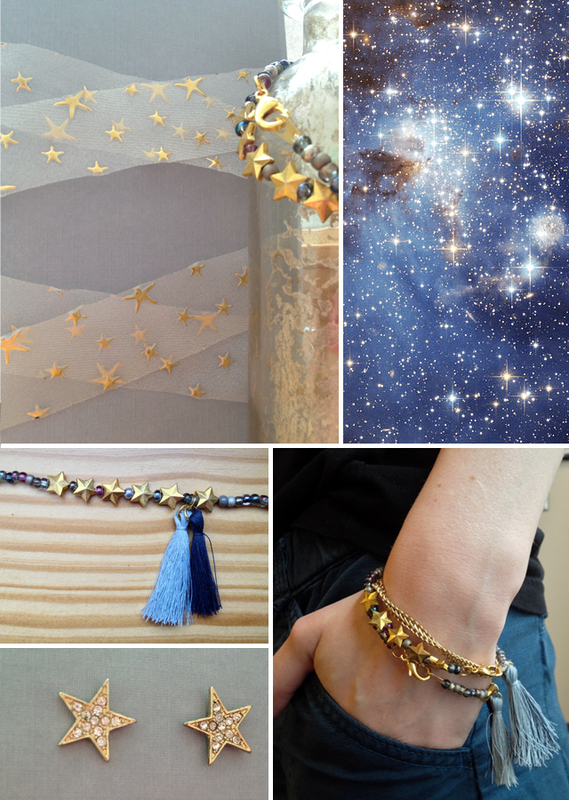 Worn alone or as a celestial pair, they’ll be perfect to toss on with a pile of bangles. Maybe there will be some time for star gazing tonight… after Breaking Bad, of course.